Watershed districts are regional units of government that work specifically to solve and prevent water-related problems. Water doesn’t follow political boundaries, so the boundary of the PLSLWD follows that of a natural watershed. The District works closely with local cities, townships, Scott County, and state agencies to accomplish its goals. 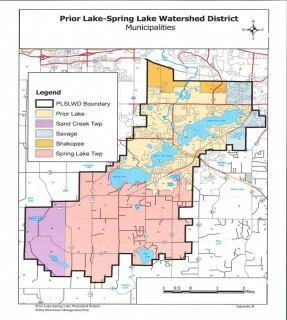 Working with local partners, the PLSLWD strives to protect, manage and improve the District’s water resources by monitoring water quality, assisting with land management, implementing water quality improvement projects, permitting and inspecting development, operating and maintaining Prior Lake water levels (including administration of the Prior Lake Outlet Channel), promoting education for residents, and more. Click on one of the links below to learn more about the projects and ongoing programs going on withing the PLSLWD.